I was staring at the OPI Germany Collection, thinking about what I could do with them, when I looked at Don't Talk Bach to Me. I kept thinking how much it looked like an avocado color. I started looking at the other colors in the collection and realized that I had all the proper colors to make a full avocado! Every avocado print needs a background color. For me, it was OPI Berlin There Done That. It's a pretty taupe shade. I used two coats for full opacity. Next, I worked on building my avocados. I began with the lighter green shade, using OPI Don't Talk Bach to Me. It really is kind of a perfect avocado color, a light yellow-green. Next, I added on the outline of the skin with OPI Nein! Nein! Nein! OK Fine! using my medium length striper brush. I then mixed Don't Talk Bach with a little bit of Nein! Nein! to make the darker green shade, which I lightly brushed on around the edges of the inside of the avocados. The last step was to add the seed! That part was easy -- I just took a dotting tool and added single dots of OPI Ger-manicure by OPI. The formula on all of these were great and gave me no issues. I love avocados, so it was probably just a matter of time before I put them on my nails. I love them alone, on turkey sandwiches, in guacamole... I could go on! I don't buy them as often as I should for the amount of love I have for them, though. I really can't believe that it worked out so perfectly to have all the colors I needed to make avocado print in one collection. 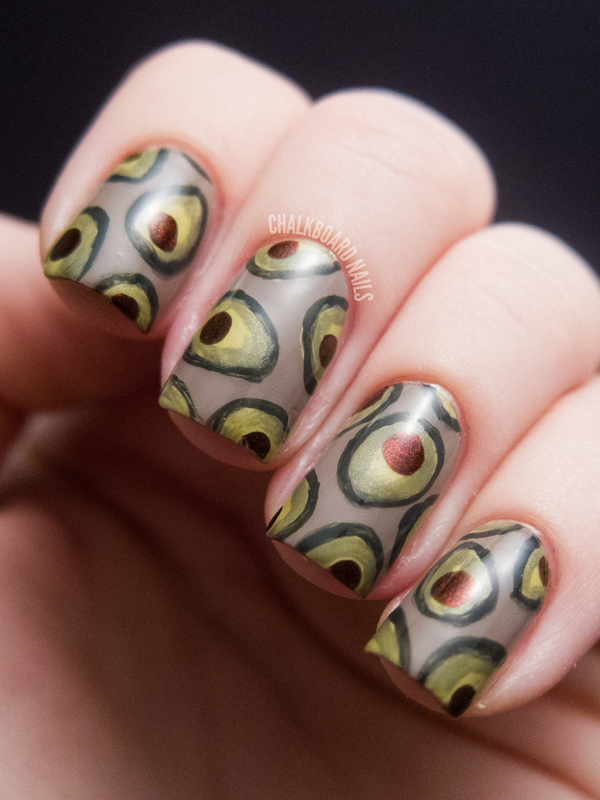 This nail art is so silly but I can't help but completely love it! Would you wear avocados on your nails? Yummm! This looks so cute and I love avocados! Very well done! I love this! Big fan of avocados! These are adorable! I love them. 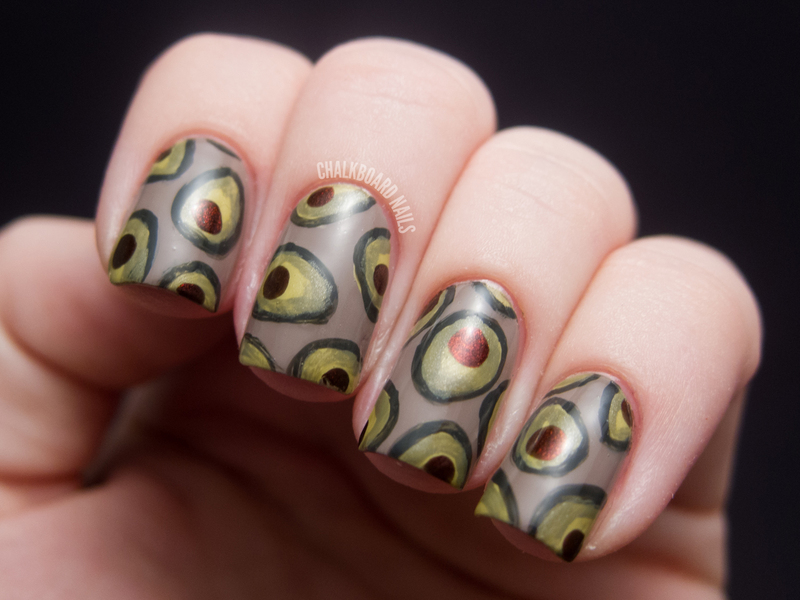 I love avocados, and also this nail art. So cute! Wow, these are really good, I know they're avocados, but they just remind of a Van Gogh painting or something.... I could get lost staring at them....great interpretation . This is so random lol. I really like it though, looks very abstract. This is so awesome!!! I love the drab colors you used, my favorite kinds of colors. Super fun! These are too cute. I love avocados! Ahhh I love it ! I don't know if you noticed, but avocados are so in right now (diet wise)! These came out so cute! Hahahaha I love these! So cute! LOL, this is funny.. they really do look like cute little avo's! YUM! MMMmmm... Avacados are so tasty! And they look wonderful as nail art! Gorgeous! I only bought the gorgeous orange from the Germany collection, but if I had the makings (and the skills! 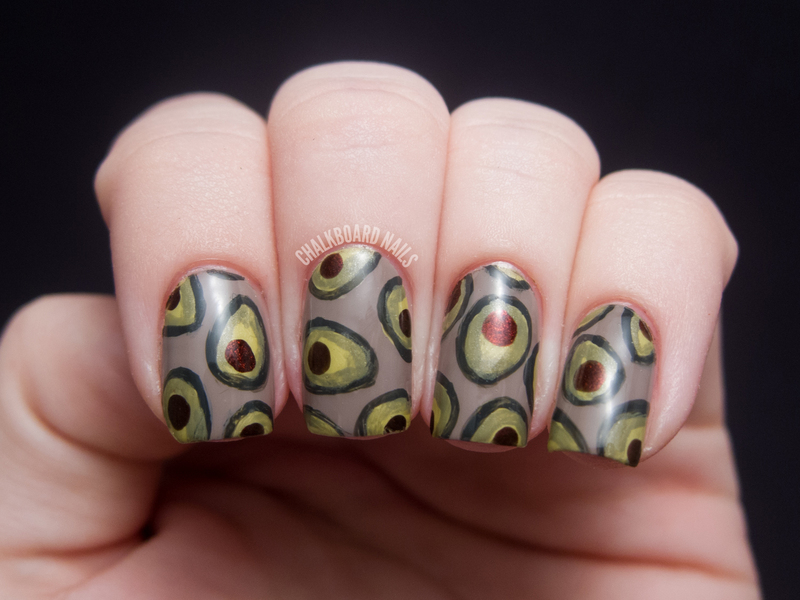 ), you can be sure I'd wear such a fun avocado mani. Hehe :) I would wear avocado nails, but since mine are shorter than yours, I'd probably do a close-up of one single fruit :). I just ate avocado today in my eggs...yum! My favorite way to enjoy them! I just got OPI Every Month is Oktoberfest today and it's SO LOVELY! Yippee! They are awesome! I would definitely wear them, even though I don't like avocados. Amazing...looks like it should be on a canvas in a gallery....love it!! I wouldn't wear avocados on my nails--but you TOTALLY made me smile :) This is so awesome and why I follow you by email--so I never miss a thing! I LOVE THESE!! I can't believe how beautiful your avocados are...hmmm, that doesn't sound quite right ;-) Anyway, YES, I would so wear avocados on my nails, especially if they are as gorgeous as these! Amazing! I really like this design and the colors you used. Very creative! You have inspired me to make an avocado milkshake. Your very creative, love this design! If you did them I would totally wear avocados on my nails! Looooove it! never would have thought to do avocados...awesome!! Love avocados on EVERYTHING. Haven't tried it on my nails, but now I must! LOVE avocados! this is so clever! OMG this is SOOOOO awesome! You and I must be the only true avocado lovers out there, because I would totally do this mani if I had your skills (and this collection!) Hahaha! Way to go...your nail art is always so creative and perfect - and your photos of it...don't even get me started. 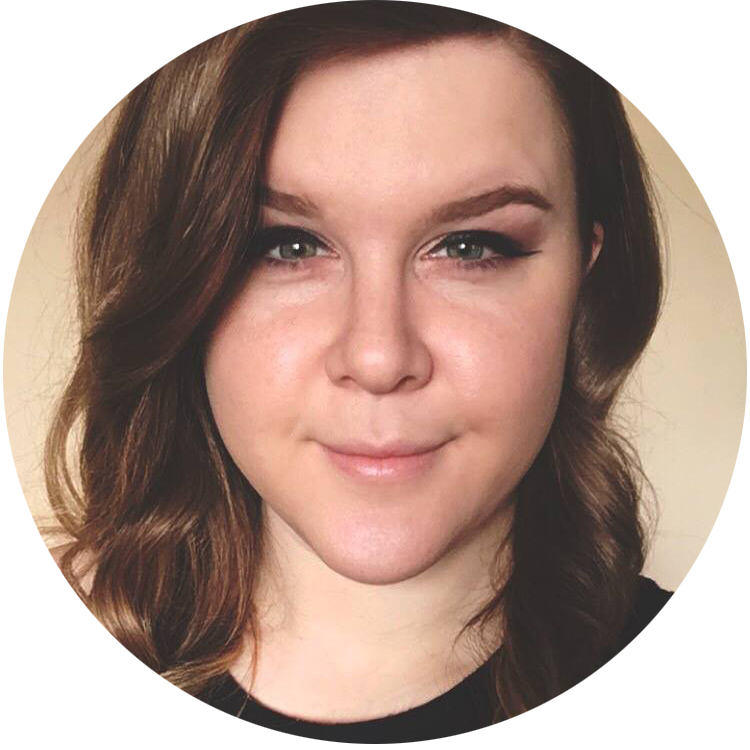 I hope my blog/photos are one day even 1/4 as amazing as yours! P.S. I just duplicated your neutral base with orange and blue dot gradient mani - LOVE it!! I missed this the first time around. Those avocados are a trip. LOOOOVE them. It's such a fabulous manicure. Makes me happy.